Do you sometimes wonder if you’re doing well within the organization your work for? Photo by gr3m. Occasionally our boss will pat our backs and tell us we did a great job. At the same time, we could feel that some of our co workers are trying to avoid working with us. Is my boss happy with my performance? Am I contributing enough to my team? Can I be relied upon to operate professionally? As an employee, we constantly wonder what our co-workers, bosses and peers think about our capabilities. After all, as an employee, we want to be a team player who is able to contribute substantially to the organization. It can be troublesome and time consuming to go ask everyone. Once we get all feedback, compiling and analyzing it could be a challenge. They may not feel comfortable telling us the truth, for example someone else always does a better job than we do. To overcome this problem, many organization have opted to perform a 360 degree feedback assessment for staffs so that they can evaluate themselves against what their co workers or customer think of them. A 360 degree feedback assessment is basically a set of questionnaires which can be used by ourself as well as others to evaluate our behaviors that lead to high performance within our roles. There are many tools out there to assist with this 360 degree feedback assessment. Today I will recommend a tool which can be used for free to carry out this evaluation online. 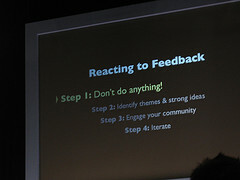 The tool that I’m referring to is Reactive360.com – SAAS Web based 360 Feedback and Appraisal System. 1. To start off, click on Instant Access and complete the form. 2. Once submitted,enter the system by clicking on Next. 3. You’ll be presented with a selection screen like below. 4. Setup a new appraisal by selecting the first option. 5. 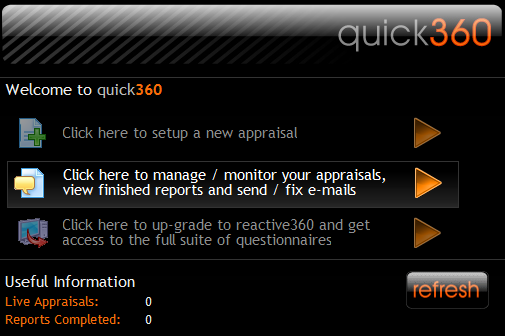 At the moment, you can only create a quick360 appraisal. 7. Click on Next and I can see that Bob has been added as an appraisee. 8. Click on Add Person to now add an appraiser. I entered Big Ben as a Manager to Bob. 9. After adding one more person, which is Sally as a customer, you can now see the following list. 10. The steps above show us how easy it is to add appraisee and appraisers. Click on Done. 11. Now that everyone’s details have been added. Click on Send Emails and Reactive360 will automatically send an email to everyone that you’ve identified. 12. The people whom you’ve identified will now receive an email telling him or her to provide feedback for you. 14. The appraiser simply gives you a score of 1-4 for all questions. 15. Once all feedback have been submitted and recorded by the system, you can now choose to generate and download a 360 feedback report which compiles and summarizes your scores. 16. 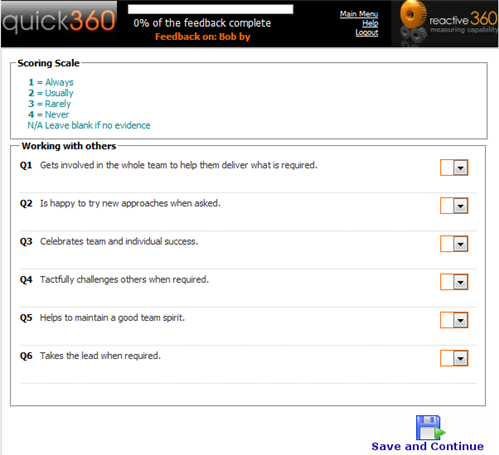 If you wish to see a sample 360 feedback appraisal report, click here. Now that you’ve got a report, you can easily see and compare how you’ve evaluated yourself against what others evaluate you. 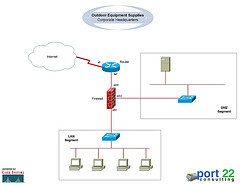 With this report, you can begin to identify key areas to improve on. 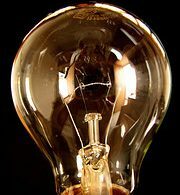 This web based tool basically handles all the technicalities so you can focus on developing what you want to find out from others. I personally feel that it’s quite a challenge to come out with a set of questions of my own as I need to ensure the questions itself are not biased and can be easily understood by appraisers. Do give this tool a try and stop worrying about how you’re doing at work today by conducting a free 360 degree feedback assessment, allowing others to tell you where to improve. mi piacerebbe sapere che tipo di impatto hanno questi sistemi con il rispetto alla legge sullla privacy. Gostaria de saber se tem alguma ferramenta de avaliação que eu consiga instalar dentro da minha empresa. sem ser modelo SAAS. I wonder if you have any assessment tool that I can install inside my company without the SAAS model. Have you looked at LimeSurvey.org? It’s also a free assessment / survey tool which you can install within your office environment. However it’s not designed to allow you to gather 360 feedback. Check it out, any questions or comments feel free to let me know. I found this very useful – we are just introducing 360 feedback as part of our approach to developing our small group of staff. After searching around using google we have decided to use a system called factors360. It seems to offer everything we need at the moment, added our own company images so the on-line questionnaire and the report are branded to match our organisation. Cost so far has been just £20.00 and we are running the process for all 8 staff. I will add some feedback when we get to the point of actually doing the feedback.